The buyers of future, maintstream electric vehicles will expect to be as warm and toasty as they are in today's gas-fuelled cars. But for now, EV drivers are still pioneers, and that implies hardship. To drive an electric car is to be an emotional pinball bouncing between hedonistic self-indulgence, smug self-righteousness and puritanical self-denial – all overcast by the spectre of range anxiety. The electric version of the Kona nails the hedonism thing with its seductive blend of tidal-wave torque, serene mechanical refinement and the agility enabled by having its heaviest component – the battery – way down low under the floor. The smugness lies in knowing you’re saving money on gas and saving the planet by driving an energy-efficient, zero-pollution automobile (holier-than-thou qualifier here: my household hydro is all renewable). And the self-denial? Trying to manage without cabin heat. When ambient temperatures head south, not much can be done about the cold’s effect on the battery itself. So I always try to minimize the range loss by leaving the HVAC switched off. Yes, I know that makes me an outlier. Future mainstream EV buyers will expect to be as warm and toasty as they are in their current gasoline-fuelled vehicles. But for now, EV drivers are still pioneers, and pioneering implies hardship. As the week went on, morning range projections after an overnight recharge would vary some. This, despite the Winter Mode that warms the battery while it’s charging. Each time I test an EV in winter, my inner puritan emerges. Leaving the house, I’m already dressed for the outdoors cold, so once I’m cocooned in the car, sitting on a heated seat and grasping a heated wheel, who needs a heater? Well, Designated Passenger does. Much of my driving involves a weekly 150-kilometre family-duty trip to Guelph, Ont., and DP doesn’t do well with range anxiety. Making the trip in an extended-range motorized refrigerator is not a DP-authorized solution either. In the early days of EVs, that meant the Guelph run was simply not possible. Then, when official EV range claims approached 200 km, it became theoretically doable, but usually still too marginal to risk in winter. Now, we have the Hyundai Kona Electric promising a class-leading official range of 415 km. That said, when the Kona test sample was delivered one Monday afternoon, the mercury read -4 C and was forecast to stay sub-zero for most of the rest of the week. Kona Electric, meet the real world. The electric version of the North American utility vehicle of the year arrived showing 80-per-cent battery state of charge (SoC) on its display, and a promising projected range of 331 km with the HVAC off – 304 km with it on. Basic arithmetic suggested that should extrapolate to 414 km (HVAC off) at 100-per-cent SoC. 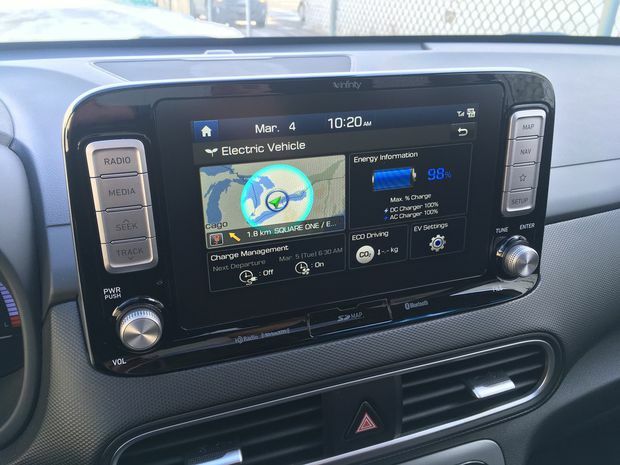 The Kona's dashboard display lets drivers keep an eye on their projected range and battery life. The reality: After an overnight top-up on a 110-volt outlet, the projected range at 100 per cent was only 359 km (for consistency, all range projections are based on heater off). As the week went on, morning projections of range after an overnight recharge would vary between 352 km and 369 km. This, despite the Winter Mode that warms the battery while it’s charging. After a bout of messy weather overnight, Tuesday dawned on a Kona encrusted in ice. The car’s defog function cleared the windshield in no time, but even with the charger still plugged in, it nibbled the range down from 359 to 357 km. If I owned the Kona, I could have remotely preheated the cabin during charging using the BlueLink app, which would help minimize use of the HVAC while driving, but that wasn’t an option on a borrowed vehicle. Usually when testing an EV I recharge every night, but I had questions. How real were those 360-ish-kilometre range predictions? What would happen when DP got cold feet? So after Tuesday night’s top-up I didn’t plug in again until I had to. Wednesday and Thursday, the Kona clocked 97 km of errand-running, about 60 per cent on freeways, which knocked the projected range down by 119 km, to 233 km. Driving solo, I’d mostly managed without HVAC, but freeway speeds guzzle battery juice. In three days and 250 km, the Kona's battery yielded 60 km to spare – so about 300 km of useable range in typical Southern Ontario midwinter conditions. As it turned out, I wouldn’t have been much warmer if I had used the Kona’s HVAC. It doesn’t eat much range, basically because it doesn’t produce a lot of heat. That said, leaving the heat off wasn’t an option for the Guelph Test on Friday. We started our 150-km round trip with the car showing a range of 233 km – even without heat. The outbound drive brutalized the battery. The route was mostly freeway, mostly uphill, and buffeted by strong headwinds. 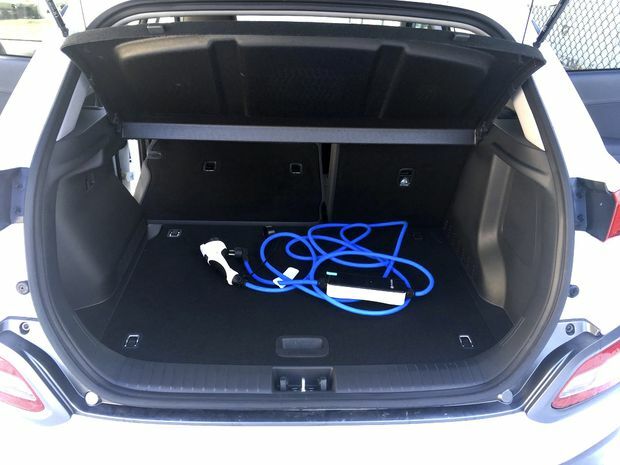 Seventy-five kilometres siphoned 106 km of range out of the battery. But that still left us with 127 km for the return trip. And going home would be downwind and net downhill. Saying nothing to DP, I crossed fingers that the 52-km cushion would be enough. But just to be sure, I googled fast-charge stations en route. Didn’t need them. The return drive was actually 78 km as we took side roads to avoid congestion on the 401, yet we rolled into our driveway showing 60 km of range remaining. With weather and topography now on our side, we’d used only 67-km worth of battery charge for 78 actual kilometres. So, three days, 250 km and still 60 km to spare – about 300 km of useable range in typical Southern Ontario midwinter conditions. That’s still only 60 per cent of a gasoline vehicle, and a lot less than 415 km. But if you were just driving the daily grind, you’d be recharging every night anyway, at a fraction of the cost of fuelling an internal-combustion vehicle. And on a long-haul trip, shouldn’t you take a break every 200-300 kilometres anyway? 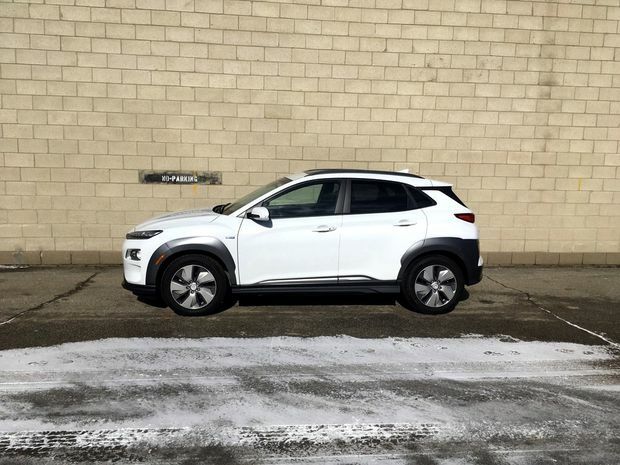 Coming back to the emotional life of EV drivers, the Kona Electric delivers fully on driving pleasure and self-righteous smugness. It also delivers a modest but helpful dose of Valium to combat range anxiety. And the self-denial? That’s more my own obsession than any fault of the car’s. I’m working on it, and EVs with longer range will be part of the cure.